Neon Night Lamps as Corporate Souvenirs- Why Go with the Neon Trend? Neon lights for venue marketing and bar promotions are all the rage nowadays. But the use of neon lights does not end here as they are also an ideal choice for the manufacture of night lamps. Case in point: these neon color night lamps we found at a recently held trade fare in Hong Kong. Being high quality, they will make great corporate souvenirs. Custom Neon Signs: How to Get the Best Out of Them? High Utility: These night lamps are great for bedrooms and office. Colorful and eye-catching, they can also be used as decorative pieces at reception areas, hotel lounge, and shops. Using them on daily basis strengthens brand recognition especially if the lamps resemble brand logo. Pleasing to the Eyes: The soft glow of the night lamp is pleasing to the eyes, making them perfect for bedside marketing. They’ll be the first and last thing clients will see before they sleep and when they wake up. Likewise, using them for corporate promotions will boost morale as seeing this gift at work will remind them how the company appreciate their hard work. Creative: Marketing managers can get creative with the designs and colors. 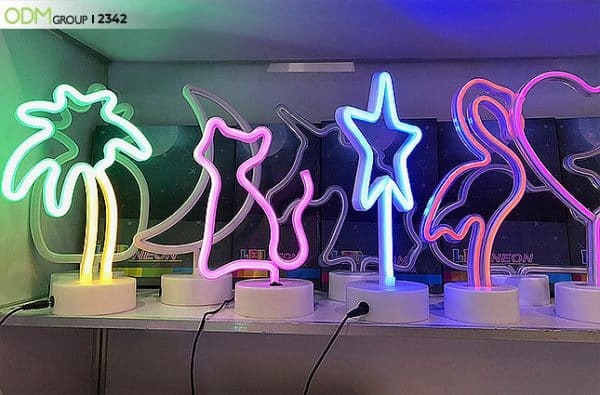 They have the option to customize the designs- whether they want fun and quirky shapes similar to our example or have their 2D logo designs made into neon lamps! Maximize Brand Exposure: When given to business partners, corporate souvenirs can help strengthen corporate relationships. This is because it shows that you value your business relationships. When given to employees, this could help bring out the best in them because they know their efforts are being acknowledged. Giving away corporate souvenirs to customers can foster loyalty or inspire repeat purchases because they get something in return for their patronage. While Neon looks great, LED can be far more eco-friendly and economical. Neon fades over time while LED requires little to no maintenance, thus ensuring the lifespan of your marketing gift. In terms of performance, there is no doubt LED is the better option. Therefore, you may want to opt for LED if you feel Neon is not for you. So, Why Go the Neon Trend for Corporate Souvenirs? Hip and trendy, the lamps are high quality so instead of the usual pen and notepad gifts, why not give them this? As they come in different colors and sizes, they give off a festive vibe that make them wonderful corporate Christmas gifts! Your employees and clients will definitely appreciate the thought. On top of that, the lamps can be in the shape of your logo or brand initials, gaining your brand maximum exposure at home, office, and shops. As they are practical, and will be used daily, they further customer engagement. When designing, you have the option to make it as simple or as elaborate as your marketing budget allows. Just make sure to work with a reputable product designers to ensure the quality of your designs. At Mindsparkz, we have in-house designers who can deliver the best designs possible for your corporate souvenirs. Send us an email to get a quote for these Neon night lamps. Product code is 2342. Speak with our merchandisers to learn more about your promotional product options. We have lots of ideas for corporate gifts from simple office items to high-end electronic items. Great for year-end parties or employee appreciation, this branded compass clock is truly high end and classy!